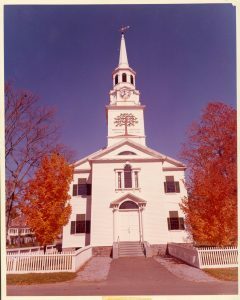 Our congregational records are arranged alphabetically by town/village/city name. So, for example, a description of the records we hold for St. Andrew’s Presbyterian Church in Guelph, Ontario would be listed under “Guelph, Ontario” within the “G” Finding Aid. For each congregation, the description will generally provide a brief history followed by a file list. The file list contains three columns: the first column contains the file number (such as “1980-4005-1-2” or “1989-8029”); the second column contains the dates of the records in the file (such as 1858-1899); and the third column contains a brief description of the file (such as “Baptismal Register” or “Session Minutes”). The descriptions are listed below and can be opened or downloaded as PDF files. Where you see a symbol substituted for a letter, we currently have no records for churches in a town/village/city beginning with that letter.